Performers working in the audiovisual sector, whether in film, television or digital media, have been effectively subsidising these industries for as long as they have existed. This may sound like a bold statement, but it is in fact quite accurate for an overwhelming majority of them. Behind the glamour there are countless small players moving the audio visual industry. What performers want most is to entertain a public, either live or on camera. It is their ultimate raison d’être, their passion, and they would endure just about anything to be offered a chance to express their talent. This is what makes them great, but also what makes them extremely vulnerable. Most of them come unprepared, as they enter this business, to face a tough and highly competitive environment. The image portrayed by the media is misleading: most performers do not live a life of riches and in fact struggle to make ends meet and pay off their monthly bills. Audiovisual performers have highly irregular career patterns, as they constantly need to be cast for new roles, juggling between short-term employment opportunities in the industry, casual work and unemployment. Every new opportunity to be cast for a role may be their last. The irregular nature of their career is a stressful component of their daily lives but also a hindering factor as they seek social protection. Social security systems are often ill-equipped to deal with freelance work, as they continue to be built on more traditional, open-ended forms of employment. As a result, many performers working in the audiovisual sector have limited or no social benefits. Adding insult to injury, they are increasingly warmly encouraged to embrace self-employment, often with a view to reducing employer costs. Under antitrust rules they may then find themselves classed as “undertakings” and therefore banned from negotiating acceptable minimum terms and conditions collectively. As independent contractors, they also have to take up private insurances to assist with anything from medical treatment to retirement. Many performers cannot afford to do so and thus find themselves in dire straits should they hit a bad patch. One singular characteristic of their work, however, is that their performances can be successfully exploited on various media and for a long time, continuing to generate fresh strings of revenue. In light of their precarious professional status, it is immensely meaningful to them to get a fair share of the income generated by their work, over and above any fee that may have been paid to them for delivering the initial performance. Every little payment can make a huge difference to them. Only a handful of high profile performers actually have enough leverage to negotiate adequate fees and use payments, either in the form of residuals, royalties or a combination of both. Even in those cases, it may be challenging for them to know exactly how much revenue is due to them, for which use and, more generally, to enforce the terms of their contract. Additional pay-outs will typically be subject to prior cost recoupment and, oddly enough, this seems to be one of the few industries in the world operating at a perpetual loss. The only “contractual freedom” for performers with less bargaining power is to sign a contract over which they have no say – and thus get their next job – or to not sign that contract and face prolonged unemployment. When such performers are in a one-to-one relationship with a producer and without the benefit of a comprehensive union agreement, contracts are consistently one-sided and imbalanced. They are colloquially referred to as “buy-outs” and imply sweeping permissions for use of a performance, in all media, in perpetuity and in the entire universe in return for an often-symbolic, upfront payment. It is not uncommon for contracts to include abusive provisions with respect to future use and/or media, or even forcing the performer’s consent to deliver extra work, e.g. dubbing or marketing appearances, for no additional premium. Contractual “freedom” usually leaves performers empty handed. In many countries around the world, it is even normal practice for them to work without the benefit of a written contract, leaving them with no redress when seeking to claim what is due to them. Needless to say, most performers hardly dare to voice an objection for fear or being blacklisted and losing future job opportunities. Many countries around the world still grant intellectual property protection to audio performances only. This is due to the fact that international norm setting struggled for many years to reach consensus on the rights of performers in film or audiovisual media. This incongruous situation finally came to an end with the adoption of the WIPO Beijing Treaty on the Protection of Audiovisual Performances in 2012, currently under ratification. Signed by 122 countries, the Treaty will not enter into force 30 eligible parties ratify or accede to it. *for more detail about the making available right see: Rights and Revenues for Music Performers. When implemented in national laws, the Treaty may finally grant an effective and meaningful protection to audiovisual performers and there certainly are built-in mechanisms to make this happen. This is not a given however. The potential advantage of these rights would be seriously undermined, where, for example, the national transposition legislates for the transfer to their producer of all these economic rights granted the talent. National legislation could do this by way of statutory presumptions. Such normative provisions would inevitably end up perpetuating the weak spot in which performers are customarily found right from the start and would be custom-made to satisfy the corporate interests of the industry. Union-negotiated agreements are the only way for most audiovisual performers to rely on a minimum safety net, above which they may try to reach individually. Most of them in practice will agree to work for those minimums that become, in essence, the industry standard. In addition to addressing key aspects of working conditions – e.g. working hours, rest periods, meals, health and safety, insurance coverage, etc. – collective bargaining agreements set out how much performers are to be paid when their performances are used in primary and secondary markets. In addition to performance fees, they may thus also establish residual payments or royalties, or a combination of both. (Broadly, a residual is a pre-established payment calculated as an agreed percentage that is determined by collective negotiation by a guild or trade body and is different depending on the type of exploitation. A royalty is calculated by reference to the revenue arising from the exploitation itself, and is established by contract and expressed as a percentage of a price base – for example, retail, or wholesale or as a percentage of the licence fee.) Compliance with these agreements grants a producer the necessary legal certainty when exploiting the performance, without the need to engage in time-consuming individual negotiations. Few talent unions, however, have gained enough leverage to stand strong at the bargaining table and improve the wellbeing of performers hired under the terms of those agreements. Those that can are notably those that managed to become very representative in countries with a sizeable audiovisual market. These unions have had to fight hard and in solidarity with each other to combat practices of a globalised industry such as flying talent across the planet not just to shoot on location but also to evade union jurisdiction. Where they have managed to do so successfully, it was always by building a stronger and cohesive membership. In several other countries, trade unions struggle, despite their efforts, to exert jurisdiction and influence over revenue-related matters. This is due to a variety of reasons: from assertive anti labour policies to the overzealous application of antitrust rules, the strong resistance of producer bodies or even the performers’ own perception of themselves as artists rather than workers. Performing is a highly skilled craft and without performers much of the entertainment our audiences enjoy on screen, television and digital new media would simply not exist. The content industry stands as a major GDP contributor and a powerful driver of innovation and technology. Films, television series, and other audiovisual content, including advertising, permeate our lives – not simply for people to enjoy but equally to be informed and educated. And yet, by and large, performers continue to subsidize these industries, as their creative skills are not adequately acknowledged and rewarded. 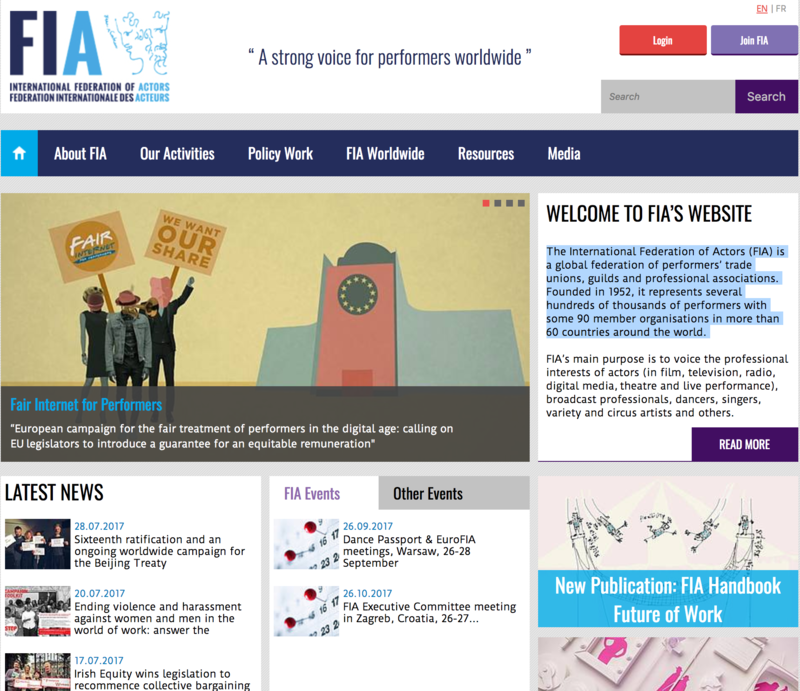 The International Federation of Actors (FIA) represents performers’ trade unions, guilds and professional associations in about 70 countries. 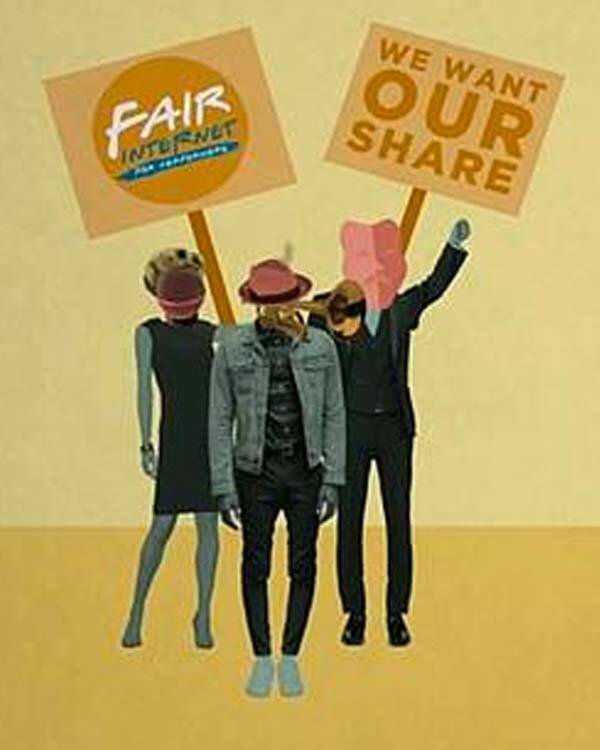 In a connected world of content and entertainment, it stands for fair social, economic and moral rights for audiovisual performers working in all recorded media and in live performance. In order to try and rebalance the interests of industry and the talent upon which industry depends the International Federation of Actors (FIA) together with three other organisations representing performers in Europe: AEPO-ARTIS (http://www.aepo-artis.org ), the International Federation of Musicians (FIM) and the International Artists’ Organisation (IAO) are carrying out a campaign to introduce into European legislation a right to remuneration for performers, collected from downloading and streaming platforms and managed by performers’ collective management organisations. Links to these organisations are found here on Fairness Rocks.